I really didn't see much of Game 7 because I went around Dave and Buster's playing silly games but all I remember watching the last 3 minutes and seeing Bruce Bowen swat Chauncey Billups' three pointer shot attempt. I think that sealed the game. I wish there was more NBA to watch but I liked this series a lot. Spurs win in Overtime! Horry is clutch. This was an awesome Game 5. Horry came off the bench and scored 21 points nearly all in the 4th and in Overtime. He was dunking, making layups, and shooting treys like he was 18. I've never seen Horry light up like this until now. So Big Shot Bob won the game. However, on the the Detroit side I would have to blame Chauncey Billups for his poor decisions that might have cost Detroit the win. Billups was trying to take control of the game by himself when he needed to pass the ball more and create some shots for his teammates like Hamilton and Prince. Once he can learn to pass I think he will be a great player. Maybe a bigger brain does make you smarter? The Spurs win game 2! The Spurs are winning the series now 2-0, and there may be no turning back. Their mental toughness and their poise is oustanding. I never wanted the Spurs to win the Finals, but now that I'm rooting for them mostly because I like their team chemistry. 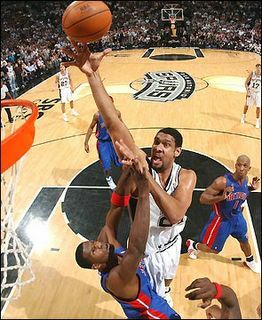 It was nice to see Duncan get up and pick up Arroyo when he got hurt, showing that the Spurs are not just about winning. They are a great team. Go Spurs! Yea so the Spurs won today. Whopdee doo. It was kinda weird looking at the scoreboard during the 4th quarter and realizing that both teams had only scored 50 points each. I guess this is somewhat better than the Pistons-Lakers matchup last year but I'm not too impressed. 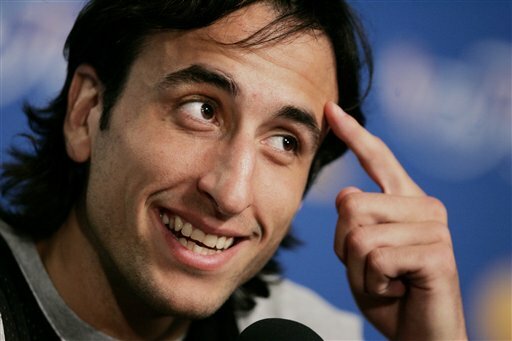 Ginobli is the man, although he plays lop-sided all the time. And Timmy is just Timmy. However, my leaning is toward Detroit because they are the defending champions and they're just a more interesting bunch to watch. I forgot who lost/won $10 on this game (either Abe or James), but it was fun watching it. Cold Fusion in the works! Funny how Google CEOs can work for less money. I like the idea that corporate managers make less money but still I believe they should be paid more than $1, considering how well their company is doing. I don't know if the same devolutes to other parts of the Google employment structure, but I heard that some Google employees don't make as much as what other employees would make in large tech firms since they are just happy enough to be working at Google. Anyways, I probably would take a similar approach to develop a company if I had a billion dollars to spare in the bank. Go Google CEOs.